After Alabama, Democrats have a big dream. The House and Senate. Democrats see a "once-in-a-lifetime opportunity" to make gains in the 2018 midterms after Doug Jones beat Roy Moore in the Alabama Senate race. BIRMINGHAM, Ala. — Wave elections happen when parties win where they aren't supposed to, and there's no place more forbidden to Democrats than Alabama. The race between Republican Roy Moore and Democrat Doug Jones was quirky, to say the least, but Jones' victory nonetheless falls on a well-established trendline that points to a major rebuke of President Donald Trump in next year's midterm elections — and potentially the 2020 presidential race beyond that. "For all of Trump's popularity with the base, the countervailing repulsion by the rest of the population drives numbers that help the Democrats," said Republican strategist Rick Wilson, a Trump critic. If it can happen in Alabama, maybe it can happen in places like Texas or Georgia, Democrats crowed and Republicans worried Wednesday. And maybe, just maybe, Democrats can pull off the ultimate inside straight and take back Congress in 2018. That's still a longshot, but the Alabama result was another data point suggesting the people who protested Trump's inauguration and tell pollsters they don't like the president will come out to vote, too. "This campaign has given a lot of people a reason to believe," Jones said Wednesday in a post-election press conference. "Things might be a long-shot, but it's possible." With Jones putting them one seat closer to taking the Senate, Democrats are eyeing not only Arizona and Nevada, but bigger reaches in Texas and Tennessee, where former Gov. Phil Bredesen recently jumped in the race. "What happened in Alabama means that Texas is more possible," Rep. Beto O’Rourke, D-Texas, who is running an uphill battle against Republican Sen. Ted Cruz, told NBC News. "It all shows the set of conditions are right." O'Rourke noted that he recently out fundraised Cruz, a household name with a national donor base, and that Trump won Texas by a margin a third as large as his one in Alabama. There is no path back to power for Democrats that ignores the South, and Democrats are also looking at governors races in some of the reddest states in the country — Georgia, South Carolina, Oklahoma, Tennessee, Kansas and even Alabama, where Republican Gov. Kay Ivey suffered some collateral damage from Moore. "I have every reason to believe that this is a generational, once-in-a-lifetime opportunity for Democrats," Washington Gov. Jay Inslee, who recently took over as head of the Democratic Governors Association, told NBC News. Voters are typically more willing to buck their state's partisan traditions in state elections than federal ones, which helps explain why blue states like Massachusetts, Illinois, Maryland, and New Jersey all ended up with Republican chief executives after GOP waves in 2010 and 2014. House strategists, who need 24 seats to retake the lower chamber, saw the beginnings of a winning 2018 coalition Tuesday night. "The Democratic base turnout in Alabama, particularly among African American voters, is a very encouraging sign for what we can accomplish in the midterms," said Democratic Congressional Campaign Committee spokesperson Tyler Law. Of course, Democrats' post-election sugar high could come crashing down like Hillary Clinton's supposedly sure-thing landslide last year. Republicans, both in private and public, say their defenses will hold. "This isn’t a rebuke of conservative values or agendas, this was a rebuke of a candidate," said Sen. Cory Gardner, R-Colo., the chairman of Senate Republicans' campaign arm. Democrats still face a terrible map in the Senate, which has them defending 10 seats next year in states Trump won, while Republicans have to protect just one in a state Clinton won. Democrats would need to keep all of those while picking off two Republican seats to take the gavel. Alabama was, after all, a very special special election, featuring the most damaged of damaged candidates, who ran the weakest of weak campaigns. Moore even skipped the last weekend of campaigning to attend a football game out of state. It may show nothing more than "Alabamans didn't want someone who dated 14-year-old girls," as Sen. Ron Johnson, R-Wisc. told reporters. But what Republicans should worry about, said former Republican National Commitee Chairman Michael Steele, is that Jones' election looked so much like the dozens of other contests this year in which Democrats surpassed their historic performance. "The ground that we've lost is incalculable for the GOP next year," Steele said on MSNBC, pointing to an "underlying rot that is occurring within the GOP on race, with women." "A lot of voters are looking at the GOP not suspiciously but with a sense of, we don't want to be a part of that," he said. Jones' victory, despite its eccentricities, looked a lot like Democrats' big wins in Virginia and New Jersey last month. All were driven by super-charged turnout from African-Americans and millennials — along with college-educated whites, especially suburban women. 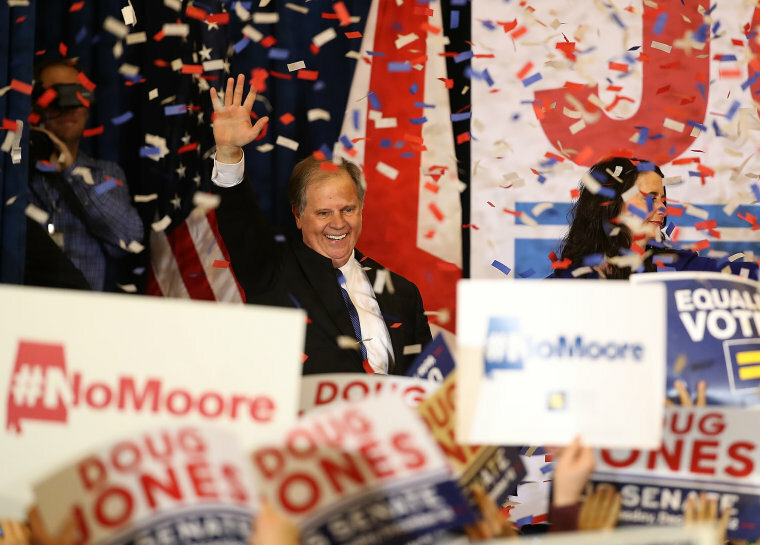 "It was like a status symbol to have a Jones sign in your yard in Mountain Brook," said Tracy James, a suburban Birmingham Republican who supported Jones. Trump's base, meanwhile, has not proven it will turnout when he is not on the ticket. Alabamians have now twice rejected the president's endorsed candidate. Bitter GOP primaries next year could produce other less-than-ideal candidates in tough races, and divide the party's votes. Guy Cecil, the president of the Democratic super PAC Priorities USA, which spent about $1.5 million boosting Jones mainly with digital ads, said things look even worse for the GOP now than they did for Democrats heading into their 2010 shellacking. Trump's approval rating just hit a new low of 32 percent in Monmouth University's latest poll, thanks largely to defections from independent women — just 14 percent now support the president. And Democrats hold a 15-point advantage in the generic ballot test, which asks if voters prefer a Democrat or Republican in the House. "Having been on both sides of waves," Cecil said. "This is something completely different, just because of the nature of Trump."